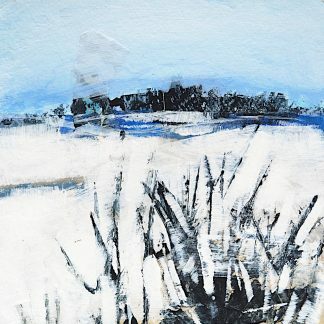 Small acrylic landscape painting on a 6″ wide x 6″ high (15.2 cm x 15.2 cm) wooden panel. Winter scene of a grove of aspen trees on a sunny day. 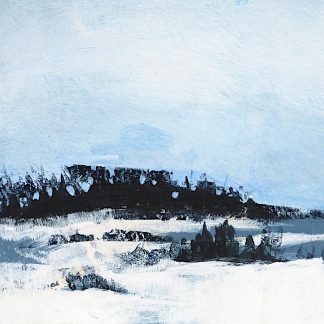 A snowy field stretches behind the trees with a forest in the distance. 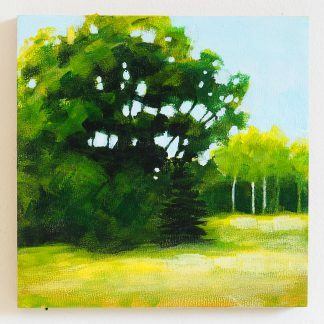 Mixed media abstract landscape, 6" x 6" Summer landscape painting, trees in a meadow, 6" x 6"